Free, drop-in. Seminars are £3 each. 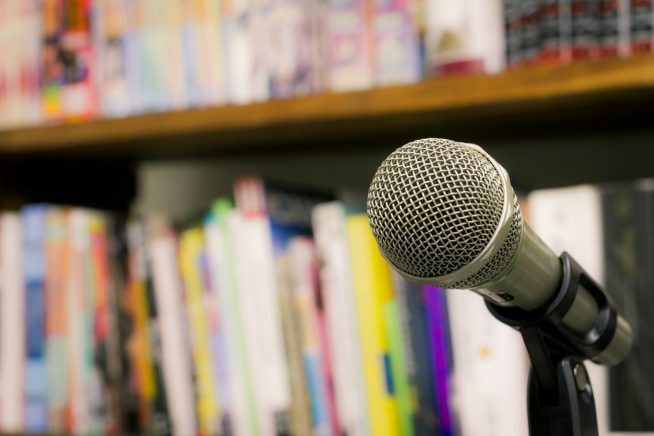 A great opportunity for book lovers, local authors or aspiring writers of all ages: Drop in to the Writers’ Slams and hear a variety of authors read from their books; meet and talk to local authors and publishers; pick up writing tips and inspiration from a wide range of seminars. Each seminar costs £3. Rooms will be confirmed on the day. There may be a few places available on the day, please visit the reception desk to book these. How do story arcs work? How to plot a story which keeps a reader hooked. Writing plots which are commercial. Practical tips and advice for anyone writing a novel. Emma Robinson is an English teacher who has completed three novels and has a contract for two more. For all science fiction and fantasy fans who want to learn a little about how to build alternative worlds. How to get the ‘rules’ of that universe across without spoiling the story. Philip Hurst has a Masters in Creative Writing from Queen’s University, Belfast, and runs www.writewithphil.com, blogging about writers and their craft. What is historical fiction and how authentic does it need to be? How should you research, write, edit and promote it, and deal with critics. Samantha Lierens has taught creative writing at SAAC and SEEC. She is writing her third historic novel with three more planned. She writes about WW1 and 2, under the name of Lizzie Page. How to re-write, edit and get your manuscript publication-ready. Understand the submission process and get guidance about options for publishing. The Novel Makers are Anita Belli, who writes 20th Century historical novels, and romance, Ellie Holmes, who writes romantic suspense novels, and Gerald Hornsby, who writes dark crime and political thrillers. The Novel Makers launches in April 19, to work with and encourage people of all ages and abilities to write and publish their work. A basic overview of the steps of writing non-fiction, and some of the pitfalls to be avoided. Simon Houghton writes manuals, handbooks and technical journals, and his latest book is ‘An Introduction to Security’. Exercises and hints for scene-setting, creating character or writing about the natural world. Bring a pen and paper! Bella D’Arcy Reed was a garden designer and journalist, and is a prize-winning writer of short stories. She is currently Writer in Residence for Essex gardens Trust. 15 more authors introduce themselves and their work in the space of an hour. Then you get to meet the ones you are interested in, and perhaps buy their books. Without embracing our community, we’d have no customers, no readers, no new writers. Learn how others can help you develop, test, share and promote your writing. Sarah will share her experiences as a self-employed writing consultant, writing group leader, event organiser and radio presenter. Her latest writers’ self-help books are Writing Naked, I’ve Got a Pen and I’m Not Afraid to Use It, and Ghosting! For all authors and poets; the pros and cons of self-publishing, costs and editorial control. Mervyn Linford is a poet, author and publisher. He has regularly performed as part of the Essex Poetry Festival. A handy guide for breaking writer’s block. Ideas for kickstarting the brain and for teasing out ideas and capturing them on paper. Discover the technique of messy writing. This session is for anyone interested in writing from the ages of 8 and upwards. Paul Jenkins was a high school drama teacher and is now Poet in Schools with National Literacy Trust and others, and stage Director with Shakespeare School Festival. What is the process for getting a movie made of your book, and what to look for in an option and acquiring the film rights. John Sealey has spent his entire working life in the film and television industry, becoming a Producer/Director working with major US and British studios. He has now turned to writing screenplays. Filming of his work for ‘If a Wicked Man’ is scheduled for filming this year. Find out why Haiku is more than just a three line, five-seven-five syllable poem, and why a three line, five-seven-five syllable poem is not necessarily a Haiku. Suitable for writers of any ability, even those who have never written a poem before. Derek Adams has led writing workshops including for London South Bank University, Festival of Suffolk Poetry, Essex Poetry Festival, and has MA in Creative and Life Writing (Goldsmiths, University of London). Advice on the process of writing, finding an agent and publisher, and the publishing process. Anyone who is starting out will find this a useful and practical seminar, and age is no barrier. Pamela Holmes had her first novel The Huntingfield Paintress published after she was sixty, following a career as an on-screen reporter. Her second book, Wyld Dreamers was published in October 2018. She has spoken at Literary Festivals and other events and run workshops on creativity and writing.